We feel pleasure to present ourselves as the leading Manufacturer, Exporter & Supplier of a wide collection of Augur Filling Machine. We manufacture it making use of top quality raw material. It is precisely designed & manufactured by us as per the customer demand. Our offered range is widely acknowledged by our customers for its longer life and effectiveness. Apart from this, our valued customers can purchase it at budget friendly prices. Augur filling machine Timer Based or volumetric based are used to fill any free flowing material, or comparatively free flowing material like flour, spice powder chemical powder, toner powder, talcum, food ingredients, food colouring agents, agro products, masala and other pharma and chemical powders can be filled very accurately by using this machine model. Accuracy this filler is very much high up to +/- 1% accuracy in each filling. Speed of filling is also high. The principle of the vertical timer based auger powder filling machine is very simple. Augur Rotation creates forward movement of the material with its flights towards the filling nozzle. Each thread (Flight) has a particular volume powder holding capacity as per material density. When the screw rotates, powder is taken by the screw and according to the direction of movement; it discharges the powder to the nozzle to the container or pouches. The pre set time on the timer controls the start and stop of rotation of augur each time. The Auger Filling Machine, which we offer, is available in a wide variety of sizes, shapes, filling principles and degrees of technical sophistication in response to the ever-widening diversity of powder filling applications around. 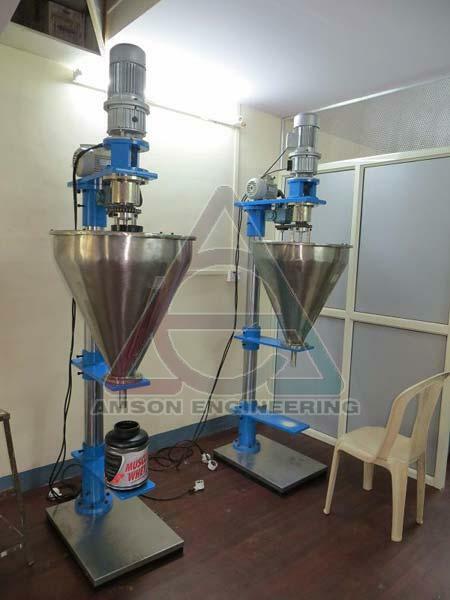 Amson Engineering is leading manufacturers of Auger Filling Machine In Mumbai.Automatic Auger Filling Machine is specially designed to get high accuracy outputs of powder in a limited time and thereby increasing the production. For achieving this, we use digital timing mechanism assisted filling to get the perfect and accurate fills each time. We designed a model, where the wastage is theoretically nil and the accuracy is maximum. Hygienic and GMP standard parts assure safety for fast contaminating products. Any free flowing material or comparatively free flowing material like flour, spice powder chemical powder, toner powder, talcum, food ingredients, food coloring agents, agro products, masala and other pharmaceutical & chemical powders can be filled very accurately by using our Auger Filling Machine. The accuracy of the Auger Filling Machine, which we provide, is very high up to +/- 1% accuracy in each filling. Speed of filling is also high, since we provide auto option for intermittent filling. The principle of the vertical Auger Filling Machine is very simple. Augur Rotation creates forward movement of the material with its flights towards the filling nozzle. Each thread (Flight) has a particular volume powder holding capacity as per material density. When the screw rotates, powder is taken by the screw and according to the direction of movement; it discharges the powder to the nozzle to the container or pouches. Augur filler is made strong and vibration free by its specially designed Pillar structure. This is made from Mild steel ROUND Pipe section of good thickness Hard chrome Plated, which holds drive unit, hopper and related parts. A drive motor and an electromagnetic clutch brake assembly are driving the Augur. A safety cover is provided to this assembly to protect from accidents and to avoid dust from drive. Main driven shaft connected to the drive shaft through a Bearing housing holds and rotates freely when the machine is operated. A stirrer blade provided separately which is operated independently over the driven shaft. The driven shaft is holding an accurately machined stainless steel Augur which performs the filling inside the Nozzle. The lower parallel flights of the auger within the funnel are machined to a constant pitch so that, when filled, each pitch has a precise volume. The auger drive rotates the auger at constant speed to produce a continuous dosing flow. The agitation blade, generally separately driven and controlled, rotates in the opposite direction to the auger breaking any bridge that tends to form in non-free flowing powders. The agitation blade extends right down to the throat of the funnel preventing rat-holing and cavitations and ensuring that the flights are fully filled. The start/stop signals to the auger drive control the pre-set weight in Weigh metric fillers. Machine size - 1050 L X 700W X 2100mm height. Stainless steel 304 Augur (Screw) type filling.